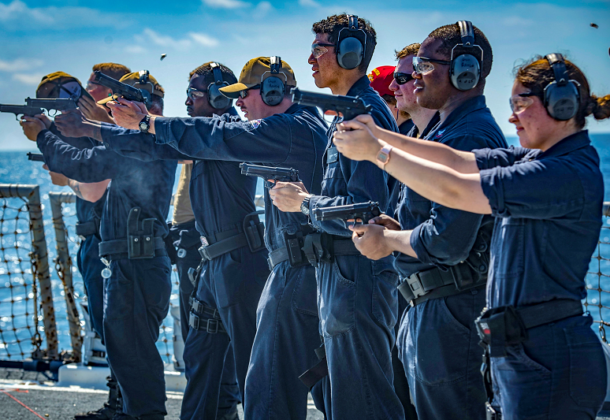 If the Navy’s going to win the next war against a great or rising power, America’s chief petty officers must prepare deck-plate sailors to fight, reports Navy Times. This message comes in the wake of warnings from ADM John Richardson, chief of naval operations, who tells sailors that the military is facing rising competition with peer and near-peer nations, reports The San Diego Union-Tribune. Bottom line: Prepare yourselves and your sailors now because all of your lives depend on it. President Donald Trump and DefSec Jim Mattis are quietly at odds with each other over several crucial national security policies, including how to deal with Russia, reports CNBC. Fifth Domain reports the head of the National Security Agency and Cyber Command is advocating for a more expansive partnership between the government and the private sector amid an array of cyberthreats. More than 50 boxes handed over by North Korea to the US appear to hold human remains from the 1950-1953 Korean War and are likely American, according to an initial forensic analysis, reports Reuters. The remains were due to be flown to Hawaii for further analysis and identification. Navy Times reports that North Korea provided just one dog tag with the transfer of the remains. Israel’s first-time activation of its David’s Sling weapon system could serve as the catalyst for export marketing efforts. The missile defense system was fired July 23 to counter a missile threat, reports Defense News. It launched two interceptors to counter two SS-21 ballistic missiles that had been fired by the Syrian government. India has approved a plan to purchase the National Advanced Surface-to-Air Missile System-II through a deal with the US, reports Defense News. The move comes before the Sept. 6 “2+2 dialogue” between India and the US to bolster bilateral defense and strategic partnership. The Air Force Academy will no longer punish cadets who are victims of sexual assault for underage drinking, fraternization, or certain other “collateral” misconduct violations, in an effort to increase reporting of such assaults, reports Air Force Times. Victims often don’t come forward because they fear being punished for crimes that would emerge during the assault investigation. The Army has been getting requests for a pizza version of its Meal, Ready to Eat for decades, reports Business Insider. After years of development, the service says its ready-to-eat pizza will be in soldiers’ hands by 2019, with availability in some areas before the end of this year. To qualify as an MRE, the meal has to last three years when stored at 80 degrees or below. Most frozen pizzas maintain best quality for about 18 months. Not all of the sailors involved in the 2018 Rim of the Pacific are human, reports Popular Mechanics. As part of the multinational naval exercise, the US Navy deployed several Mark 7 Marine Mammal Systems, also known as dolphins, on an exercise designed to locate sea mines. The dolphins are trained to locate mines and mark them for disposal, and in return get praise and fish treats. The Navy has exercised options adding several million dollars to the future guided-missile frigate — FFG(X) — conceptual design work being performed by five shipbuilders in contention for the final hull design. USNI reports the Navy expects bids from Austal USA, Huntington Ingalls Industries, General Dynamics Bath Iron Works, Lockheed Martin, and Fincantieri Marinette Marine. The Navy is planning to award a single-source design and construction contract in 2020. Ultimately, the Navy wants to build a fleet of 20 frigates. The Trump administration plans to propose slapping a 25 percent tariff on $200 billion of imported Chinese goods after initially setting them at 10 percent, in a bid to pressure Beijing into making trade concessions, reports CNBC. While the tariffs would not be imposed until after a period of public comment, raising the proposed level to 25 percent could escalate the trade dispute between the world’s two biggest economies. National Academy of Sciences, Washington, District of Columbia, has been awarded a $100,791,424 indefinite-delivery/indefinite-quantity, hybrid firm-fixed-price/cost-reimbursable contract for the enlistment and hiring of highly-qualified, non-government, Ph.D.-level scientists and engineers on limited-term appointments as research associates in Air Force laboratories. Services include attracting applicants (outreach, promotion and recruitment); conducting board/review panels; and managing and executing the program. Work will be performed in Washington, District of Columbia, and is expected to be completed by July 31, 2023. This award is the result of a competitive acquisition, and four offers were received. Fiscal 2018-2023 research and development funds are to be obligated at the task order level. Therefore, no funds are being obligated at the time of award. The Air Force Office of Scientific Research, Arlington, Virginia, is the contracting activity. Leidos Innovation Corp., Reston, Virginia, has been awarded a $63,189,976 cost-plus-fixed-fee contract for information technology services supporting the Air Force National Capital Region. This contract provides for information technology and telecommunications services to support Air Force customers within the Air Force National Capital Region. Work will be performed at Joint Base Andrews, Maryland; Joint Base Anacostia-Bolling, Washington, District of Columbia; the Pentagon, Arlington, Virginia; and other Air Force organizations within the National Capital Region. The period of performance will be Aug. 1, 2018 – July 31, 2019. This award is the result of sole-source acquisition. Fiscal 2018 operations and maintenance funds in the amount of $21,542,620 are being obligated at the time of award. The Air Force District of Washington Contracting Directorate, Joint Base Andrews, Maryland, is the contracting activity (FA8732-15-D-0043-FA701418F3042). CACI-ISS Inc., Chantilly, Virginia, has been awarded a not-to-exceed $34,610,000 firm-fixed price contract for expeditionary/contingency medical materiel services. This contract provides critical medical logistical support personnel for routine staffing at various locations for assemblage packaging of war reserve materiel, inspections, and audits; and provides medical logistical support personnel for temporary surge in workload for contingency, humanitarian, and base exercises. This contract supports 90 Air Force sites, 93 Air National Guard sites, one Army site, and an undisclosed number of sites in support of the Janus project. Work will be performed at Joint Base San Antonio-Kelly, Texas, and is expected to be completed by July 31, 2020. This award is the result of a sole-source acquisition. Fiscal 2018 operations and maintenance funds in the amount of $3,956,553 are being obligated at the time of award. Air Force Installation Contracting Agency, Wright-Patterson Air Force Base, Ohio, is the contracting activity (FA8003-18-C-0003).